Fantasy Life, released today by Nintendo for 3DS, is not so much a video game as it is a to-do list. Playing this game is akin to performing a series of increasingly difficult household chores. Some games ask you to slay demons or explore the frontiers of space; Fantasy Life asks you to go find some vegetables and cook dinner. Yet… somehow, the talented developers at Level-5 have turned what could have been mindless tedium into a sparkling, joyful game where doing even the most mundane tasks feels like participating in one big goofy ecosystem. Fetch quests that might seem vestigial in another RPG are somehow meaningful and satisfying in Fantasy Life. It's crazy. The crux of Fantasy Life is this: you, a silent character with customizable eyebrows, can pick one of 12 different Lives: Paladin, Hunter, Mercenary, Wizard, Miner, Woodcutter, Angler, Cook, Blacksmith, Carpenter, Tailor, Alchemist. In this game, a Life is essentially your job—play as a Cook, for example, and you're tasked with prepping sashimi and frying up omelettes through button-tapping mini-games. Choose Paladin and you'll have to go out into the world and hunt down monsters. Play as a Wizard and you'll get to cast spells and take orders from a cat. You can switch Lives whenever you want, and in fact, juggling different careers is the best way to get the most out of Fantasy Life. So if you feel like exploring a forest area, you might want to switch to Woodcutter and cut down trees while you're at it. You can then flip over to Carpenter to put those logs to work. If your adventures take you somewhere more dangerous, you'll probably want to switch to Paladin or Wizard to test out your combat skills. (Sadly, combat itself isn't very interesting.) Later, when you're back in the city, you can get together all those random ingredients and items you picked up on your journeys and use them to cook up some food or mix potions. It's a satisfying, addictive loop that feels rewarding thanks to A) varied layers of progression both based on how much money you earn and how accomplished you are at each job; B) the overabundance of Things to collect and use; C) tons and tons of fetch quests given to you not only by your Life teacher, but by random NPCs (all of whom have their own names and personalities, in true Animal Crossing style). There's also a story involving a talking butterfly and meteors or something. I dunno, I haven't really been paying attention. Those omelettes aren't cooking themselves. I've played about five hours of the game so far—not nearly enough to give it a full review, but enough to say that I really like it. 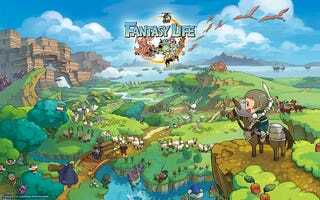 Fantasy Life gets the Random Encounters Two Thumbs Up. It's funny: games like this have usually never done much for me. As a kid I found Harvest Moon boring, and even when everyone else at Kotaku was obsessing over Animal Crossing last year, I just couldn't play it for more than a couple of hours. But there's something special about Fantasy Life. Maybe it's the dialogue, expertly crafted by Nintendo's crack-team of Treehouse writers. Maybe it's the music, reminiscent of last year's Ni no Kuni in its grandiose peppiness, composed by the legendary Nobuo Uematsu. Maybe it's the art direction, which took roots in illustrations by Final Fantasy artist Yoshitaka Amano. Goddamn. When you write it out like that, this sure was an all-star dev team, huh? At its very core, I think what's appealing to me about Fantasy Life is the same thing that's kept me up playing Destiny just about every night for the past month and a half: chores can be fun, if they're packaged properly. Random Encounters is a column dedicated to all things JRPG. You can reach Jason at jason@kotaku.com or on Twitter at @jasonschreier.